We offer a wide variety of additional services. Please continue to check back for more information! Or Contact us at: Animal Medical Services Mount Airy, NC (336) 786-9444 or Galax Veterinary Clinic Galax, Virginia (276) 236-4212 Please also browse our "All Services" Section for information as it becomes available! Whether your loss is recent or you’ve been grieving for weeks, we are here to help you through this sad transition. We can also help your children understand and cope with their feelings. See our Links page for additional resources. Please don’t hesitate to contact us. Need a someone besides us to talk to? The VMRCVM Pet Loss Support Hotline can be reached at 540-231-8038. The hotline is staffed by trained student volunteers on Tuesday and Thursday evenings from 6 – 9 pm. 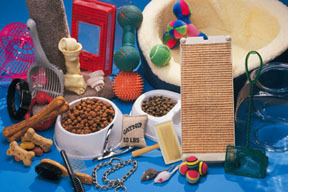 With so many accessories available from pet stores, we know you have hundreds of options to choose from. However, not all of them are safe for pets. When you purchase accessories from us, you know they’ve been carefully selected with your pet’s safety in mind. Plus, we have the experience and expertise to help guide you toward the right choices for your pet. We carry a variety of collars, leashes, and harnesses that are specifically designed to keep your pet safe and comfortable. Our halter devices can help you train your dog, making walks much more pleasant—without all the pulling. When you buy one of our halters, we include a “how to” lesson from a canine behavior expert. The treat and chew products we carry are selected to prevent obesity, help dental health and avoid digestive problems. We also have a variety of helpful items to solve everyday problems such as tear staining, “doggie odor”, and inappropriate urination in cats. Stop by to check out the accessories and toys in our reception area, or feel free to browse our selection during your next visit. Maybe you’ll find your pet’s new favorite toy!